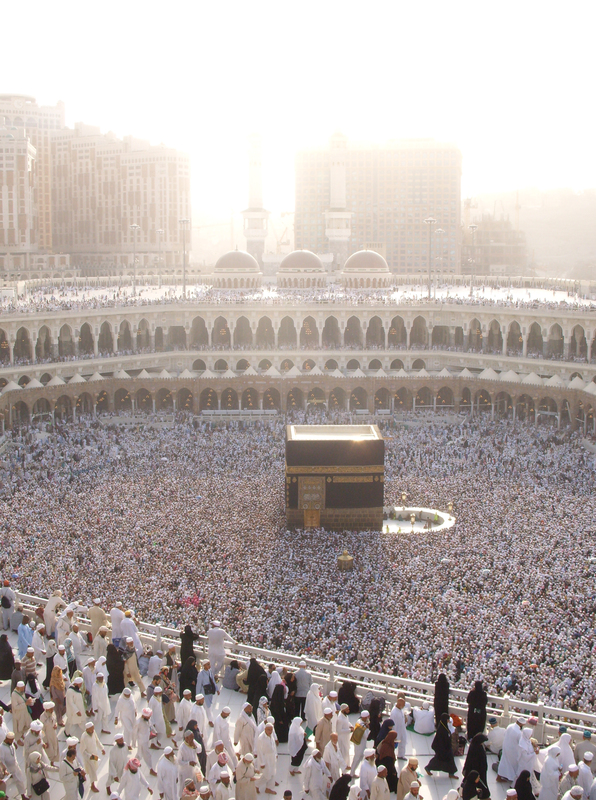 I was recently blessed to be able to go on a very powerful and spiritual journey to Mecca to complete the Hajj pilgrimage, one of the 5 pillars of the Muslim faith. During my trip, I kept a travel journal to document my experiences, reflections, aspirations, and more. This is a transcript of those journal entries. I’ll also be including photos and videos along the way. There are a total of 2 books. Each day’s posts will be broken up into smaller sections that will be released every few days, with different themes, until all 23 days are complete. The journal progresses as the journey does, so be sure to keep reading to see how my perspectives evolved and matured throughout the trip. Click Here to Start from Day 1. You can also scroll along the right sidebar to see posts from other days. There’s also an FAQ section you can visit, especially great for those of you making preparations to go to Hajj yourselves. Our journey, it seems, is never complete without some wholesome, hearty tests of patience. It’s 3:30 am. Our flight back to DC is at 8:25 am, in Jeddah, which is an hour and a half from Mecca. We’re still in Aziziah. We’ve been waiting for hours on the front stoop of our building, with no sign of our bus to take us to the airport. This whole day has been one long waiting game. The anticipation has been killer. The patience here is almost entirely run out, I feel like people in our group are on the verge of snapping. Some people – men and women – have actually broken down into tears out of anxiety about potentially missing their flights. I’m totally calm myself, accepting of the real fact that we may very well miss our flight. Our trip organizer is basically BSing us, saying the bus is coming. But, we’ve been hearing this for over 2 hours. I’ve winded down over the past 2 days. I’m ready to go, but there’s just nothing to do but let the mind wander. This is a test though, like all the others we overcame these past 3 weeks. Who knows what we’re meant to do? I’m going to continue sitting here and waiting patiently for My Host to reveal His Plan to return us home. Or, if we are meant to stay, we must accept our fate. Allah is the best of planners. La ilaaha illa hu. We waited from 1 am until 4 am, when our bus finally showed up. We actually stopped a large cargo truck that was passing by before our bus came, and decided to start packing the whole group’s luggage into it to save time in loading our bus, in anticipation of there not being enough space on our bus to hold all of our bags. The wait for the bus and the drive to the airport were both very nerve-wracking. Alot of people just couldn’t take it, the fear of missing the flight was too much. We’ve always been told to arrive at the airport here at least 12 hours early, to even have a chance of getting through to flights on time. Our bus arrived at the airport in Jeddah at 6 am. Our flight was scheduled for 8:25 am. SubhanAllah, by 6:40, we were all done checking in and just went straight onto the plane. We got there and the clerks were like hey! we’ve been expecting you guys. It was so smooth it’s not even funny. Allah is indeed the best of planners, that’s real. We had one final scare when even this bus driver didn’t know how to get to the airport. I mean, really? How all yall drive buses and don’t even know how to get to the major airport? That was it for some people. Luckily, the truck driver we hired to carry our luggage had our group leader with him, so he called us to guide our lost driver. Did I mention I unloaded this truck full of luggage single-handedly? 36 people, close to 70 pieces of luggage, all by myself ,with not so much as a thank you or look of acknowledgement. Alrighty then. That’s not why I did it, but just surprised at how quickly we forget patience and how seriously committed we are to self-service. I’m no exception. Truly blessed is he who, on that Day, will call out for his Ummah, while all will cry out only for themselves. May Allah guide us and bless us to be amongst those closest to Al Mustafa. I’m on the plane now. I just set my watch to D.C. time :), we have about 10 hours left. I just watched Rise of the Planet of the Apes – pretty dope, 4 stars. Gonna keep watching these flicks till we show up, just killing time now. Alhamdulillah fil kulli hal. Allahu Akbar! 2 hours left til landing. Everything’s nice and smooth Alhamdulillah. Also watched Super 8 – 3.5 stars, and Henry’s Crime – 4 stars. Started watching Green Lantern, but it sucked so I stopped after half an hour. I wanna also watch The Help, Wrecked, Smurfs, The Beaver, and Source Code. Thank God for in-flight entertainment. Home. Feels as foreign as Jeddah did 3 weeks ago. Within 5 minutes, I knew I was back though. We arrived at 1:20 pm. We got through immigration by 2:10 pm and were outside with our bags by 2:40 pm, Alhamdulillah. We waited in line for a while at Customs. Hold up. Let me say that again. We waited. In Line…like…civilized Human beings. It was so simple, but so relieving. I kept fighting the urge to push through and shove my way to the front. It had become second-nature over the past 3 weeks to behave this way, just as a matter of survival. Ironically, many of the people that you would tussle with in crowds to get somewhere were standing calmly and peacefully in the same line as you. Suddenly, we all have etiquette again. Way to go, America. I was also thrilled to see Latinos! I haven’t seen a Latino in 3 weeks! White people too. You don’t understand how good it felt to be around some European diversity again. Sure, they stare at you funny, something I also miss ;), but at least they behave! mA. The sight of that flag too, Allahu Akbar. Never have I really felt a sincere appreciation like this for this country. We truly are blessed to live here. Allah blessed mankind with something uniquely magnificent with this nation. What a great opportunity, what a blessing to be here. I was happy to see officials that speak English too! Shooo, question me all you want, I’m home papa, that’s all that matters. Alhamdulillah, no problems though, got right through. My uncle and aunt picked us up, we’re riding back now from Dulles Airport, almost home. It’s about 20 more mins. My parents are going on about all the problems they faced – complaining so much. I’m like yo – can we mention some good things too. Khair, iA. Hajji’s don’t always realize the affect their stories have on others, and the appalling things tend to stick out more. If you ever go for Hajj, try to share the good experiences you had too. The next stage is adjusting, conveying those messages and stories – finding focus in life, learning from the experiences, and sharing them with others. Alhamdulillah wa Shukr. Ya Rabb, please continue to help me through and to keep focus. Thank you for bringing us back safely. Now begins the real journey. Thank you all so much for your wonderful support and participation on this site. I set out to transcribe all of my written posts from Hajj online and to share them with everyone, but it’s amazing how much life really catches up to you, with plans of its own. Please excuse my delays. I’m still trying to finish posting everything from my journal, there’s only a few more posts left! I’m going to try to at least have everything up before Hajj actually begins this year iA. In the meantime, I wanted to share some advice and responses to questions I’ve been getting from friends and others preparing to go for Hajj this year. Please feel free to share, comment, ask questions, or add your own advice. I hope this can serve as a benefit for everyone making their preparations now for their own journeys. I pray all those that are embarking for Hajj are met with many blessings and opportunities. I pray you are able to share intimate moments with your Creator and find profound openings and insights, both into the nature of your world and into the nature of your own soul. May Allah protect, inspire, and illuminate you through your return to Him, and may your return to your families and communities carry parts of that illumination, to be spread generously through your righteously guided words and actions. Please remember me in your prayers, may Allah accept all of your du’as and make you among those whose prayers are always answered. Hajj Mabrur iA. Ameen! The theme Surah for this Hajj has been Ash-Sharh, through & through. Every hardship comes with an ease, subhanAllah. It’s also a bit of a relief to find that each soul is only tested with what it can handle. Some people bear such heavy burdens, Allah has also given them broad shoulders, mA. I’m not saying this because I’m in a test now, I’m actually very much at ease, but I do want to preserve these reflections iA. Others around me are starting to face severe tests in trying to travel back home, so something big may come for us too. We’ll see iA. 1. Have We not opened your breast for you (O Muhammad)? 3. Which weighed down your back? 4. And raised high your fame? 6. Verily, with the hardship, there is relief. 7. So when you have finished (from your occupation), then stand up for Allah’s worship. 8. And to your Lord (Alone) turn (all your intentions and hopes and) your invocations. The nature of these tests is so interesting. If you think about it, what is it that’s being tested? It’s whether or not you remember and turn to Allah. That’s it. It’s not a test of whether you overcome obstacles- often you’re in situations you have no power to overcome. That’s not even the point. All you have to do is remember Allah and remain patient. He then supports you, when the time is right, with His Signs and Divine Support and pulls you out of the situations He puts you in. He may show you an open door when you turn to Him and that’ll be your way out. Maybe, the test will be more severe and so the Signs and Support won’t come right away- in those cases, how long will you turn to Allah, especially when there’s silence? How long will you continue to put your faith there? That is part of the test as well. The test is not about winning and succeeding on your own merit. Sometimes, the only way to win is to lose miserably. Success is only in achieving nearness to Him, Subhanahu wa Ta’ala. Turn to Him, you pass, every time. For as long as the test lasts, stay turned towards Him, you pass. Turn away, try to rely on your own abilities, try to show pride and arrogance, you fail- or, the test will stay and endure while your efforts fail, one by one, in hopes that you see your own errors and finally turn to Him. Pass. Or, maybe He’ll allow the test to subside after you’ve made an effort without turning to him, allowing you to believe in your own self, that’s the worst failure by far. It looks like success, but just sets you up for a very, very rude awakening later on when He stops letting you just get by. All success is through Allah alone. Just turn to Him, khallas. The Qur’an is a major key, so is Salah. They’re tools that will help me retain this state and improve on it once I return, I know it. How exactly to employ them, I’m not 100% sure yet. Hopefully, I can gain some further insight before I head back tomorrow. Ya Rab, please help guide me in this effort. I need to look into this further and do more thinking, learning, reflecting around this subject iA. Hearing the imam recite Surah Ta-Ha in ‘Isha and knowing some of the background behind the Surah did things to my heart. After Hajj, I’ve also had more of a strong desire to read and recite Qur’an, so I’ll randomly bust out into recitation and totally love it :). Salah, which uses Qur’an to communicate, is also somehow vital. I’m realizing more and more that there’s an art to it, and I totally want to master it. There’s way more depth to it, much greater than the mindless recitation and empty movements we’ve unfortunately degraded it to. Ya Rabb, Master of All creation, make me a master of salah, benefit me with this most generous bounty, Ameen. I’ve also been contemplating our time, compared with the Prophet’s. So many of our problems are the same, yet we have to adapt our approach, change/tweak our solutions, to make them more applicable. For example- Qur’an is such a great source of guidance, but so many of us just don’t speak Arabic, even as Muslims. So not only should we learn it to understand better, of course, but we have to consider how we intend to spread the message to those unfamiliar- while presenting it as something native, like the Prophet did. The message, logistically, was always local and organic, very much a Meccan phenomena. Such is the wisdom of Allah- presenting things that are difficult to grasp through comfortable channels of access at least. We have to do the same thing when we present the message- not as an Arab thing, but a natural, relevant, localized thing, that’s the real key. There’s also the case of the inevitable connection with the Arab/Muslim world, the so-called “3rd World” in general. In the West, having to connect to a body that lives in such a state would be seen as regression, not progression. It would be perceived as moving backwards, not forwards. So, our role can be twofold: to present the message in a way that makes it relevant for the people being addressed and to try uplifting and improving the developing world, most especially the Hold Lands, to more modern standards and quality of living. This should benefit all, while keeping touch with the essence of the message of Islam. Ya Allah, please guide us to accomplish these ambitious ends. Please use us to do Your work and guide and bless our efforts at each step. You have blessed us greatly, please help us to show thanks for these blessings and to find ways to spread them throughout Your Dominion on this Earth. Right. So my dad is really sick. He’s got a fever and a really sore throat. He’s havin a really tough time right now. We just got back to Aziziah. We went to the Haram to pray Jumu’ah. It was crazy packed. Like…stupid crazy packed. My dad really wanted to go do our tawaf al-wada’ today, the farewell tawaf. My mom & I were like, “um…you know it’s gonna be super busy on Friday, right?” He persisted, so we went. After seeing the rush firsthand, he decided he needed to get out. We grabbed a cab and came back, it’s like 2:45 pm right now. The jumu’ah was led by Sudais. You could tell it was him by his voice. I guess he only comes out on special occasions. I don’t see what the big deal is personally, I’m totally not a Sudais fan. I like most of the imams that lead prayer in the Haram though- even though I have no idea who they are. I wish there was a way to know who your imam was each time. Do they ever bring my man El-Afasy into the mix? He’s the only Qari I enjoy, mA. I know I prayed behind Shuraim as well, he’s good too. I don’t know who led the prayer yesterday, but it sounded familiar. This morning was tough for me. I’ve totally returned back to my normal mental state. I barely prayed Fajr and was super tired. I had a hard time getting up to go out for jumu’ah. I’m really starting to miss home too. The comfort of being back in that familiar place is overriding my desire to be here slowly. If only there could be a masjid al-Haram in Washington D.C….maybe we could do like the Mormons & just make one up? Yesterday was the first day, since being here, that I realized I haven’t driven in 3 weeks. I miss my car. I don’t miss speeding tickets though. Crap! I should’ve made du’a for a clean driving record! See, the little worldly things are starting to settle back into the mind. Today, while sitting in the masjid, my mind started wandering to worldly problems I would have to deal with when I return. I had to be like, “blah! I’ll deal with that stuff when I get back, I need to focus, I’m still here- in the Masjid Al-Haram!” That’s just something I tend to do. I know I’m leaving soon, so I prepare myself mentally and act as if I’m already gone. So, whatever I miss is what I know to focus on before I actually leave. Even in doing that though, you have to disconnect with the current place and I don’t actually want to do that here. I think I’ve had a hard time buying gifts and souvenirs for that reason. It’s a way of accepting that you’re leaving or that your time in this place is very limited. I bought some stuff, but I mostly just haven’t been motivated. All the stuff you find here is the same stuff everyone always brings back, you know everyone’s tired of it. Hopefully, the stuff I got won’t be too boring- I know I’ma end up leaving people out. Oh well, this was a spiritual journey, not a trip to the mall. I made du’a for most people I could think of. That’s far greater than a 2 riyal kufi and a cheap bottle of ‘itr, trust me. Just got our ZamZam to go, 10L each. We were assured by the shop-owners that they’re God-fearing and only use the real thing. Ok…if you say so. I haven’t listened to music in a while, since I’ve been here actually. Sometimes, I miss the melodies, but my mind stays so much more clear. That’s so valuable. I actually have creative thoughts and insightful reflections, rather than blasting music and drowning out all brain activity. Too much of my time would get spent like that- putting off thinking and reflecting and just getting by in a mentally vegetated state. There needs to be a balance, I don’t want to cut it out altogether. This will be one of my challenges upon returning. It’s close to 6:30 pm, we just did some shopping and prayed Maghrib. I really need to learn how to count in Arabic, like at the very least, in addition to the other basic Arabic I need to learn. Counting to 100 is essential, shopping would be so much easier- so would haggling with cab drivers. How cool would it be if organizations teamed up with the Hajj Ministry and worked on delivering aid, or providing education on health, hygiene, etc to Hajji’s, traveling to the Haram? I think that’d be a dope program and would reach millions of people each year- mostly new ones each time. It would also spread awareness about the organizations, in the heartland especially, and relieve some of the burden from the Saudi Ministry. Gives nonprofits a chance to do something right for alot of people, where there’s alot of room for complaint. Maybe something to help prevent people from getting sick too? Just a thought iA. Long day. Productive though, not hard at all, Alhamdulillah. I’m back in Aziziah now, it’s about 10pm. Gettin ready to knock out soon iA. I caught a packed taxi to the Haram. Only 10 riyals, and I got to sit in a complete stranger’s lap. Win-win, I say. On the way, coming in from the North, I saw Masjid Al-Jinn, and a few other places I recognized from the book I was reading. 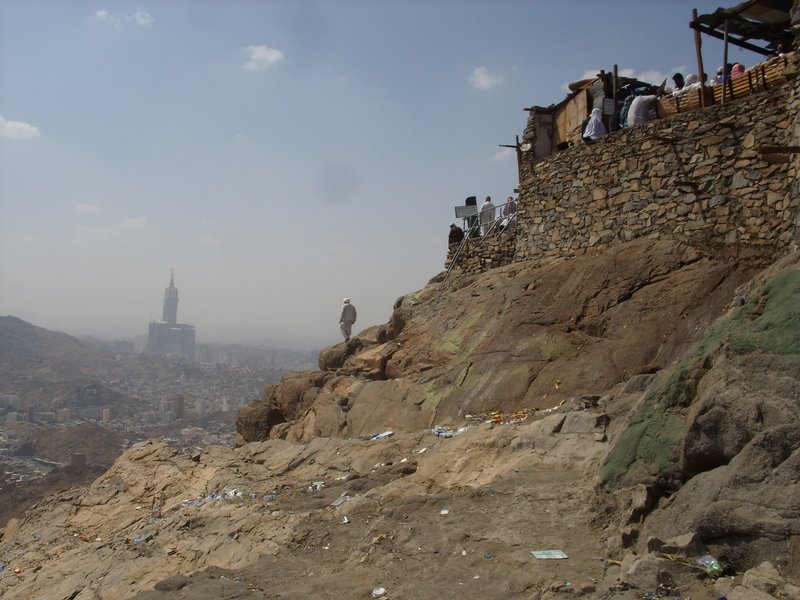 Interestingly, Masjid Al-Jinn was established in the place where the Prophet met a group of Jinn, outside the city, to teach them about the Message. This place is now 2 blocks away from the Masjid Al-Haram. That’s how much the masjid has expanded since then. It was cool to be able to pick stuff like that out. 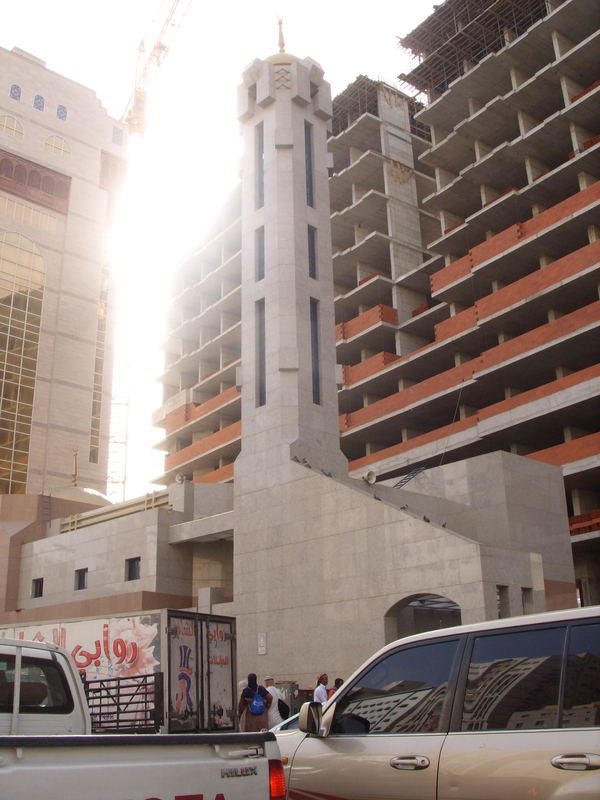 Masjid Al-Jinn itself actually seems pretty ordinary, with a little retro-futuristic design on the minaret. Otherwise, looked like any other neighborhood mosque. Maybe I can check it out inside at some point and get a better look iA. I got to the Haram just in time for ‘Asr and prayed in the street. Afterwards, I went up to the roof of the Massa’, the distance between Safa & Marwa, and took an awesome nap, next to a group of West African brothers. I slept for like an hour in the shade, with the cool breeze blowing. I got my fill of ZamZam too, Alhamdulillah. Started to feel so refreshed. It’s been a good day, all in all. I did a lot on my own, went around and saw things I had been meaning to see. Glad I got all that done, Alhamdulillah. I’m basically ready to leave, at least mentally. After Maghrib in the mosque, it settled on me that I’d be leaving soon, and I got so sad. I miss home and my loved ones there, but this place has reached such a special place in my heart – comparable to none. I felt like a void was filled partially in coming here and experiencing this place. It seems like the tests have…stopped. The burden is lifted, but the connection also seems to have faded. I felt so much more in tune with my Lord while I was on Hajj, being tested by Him. Hardship truly does bring one closer to Allah, that reason alone makes it an immense blessing. My life actually feels normal again. I feel like I’ve always felt. Not sure I like it, how do I get back the bliss and the insight from The Most Near? For that feeling, I would try to come for Hajj again and again, subhanAllah. Here is a virtue that has its place in the world. I didn’t even realize the blessing I had, and now that it’s passed, I feel its absence sorely. I’m going to have to continuously look out for other ways to draw near. I have a feeling it’s going to be even more difficult from here. What follows is real life. 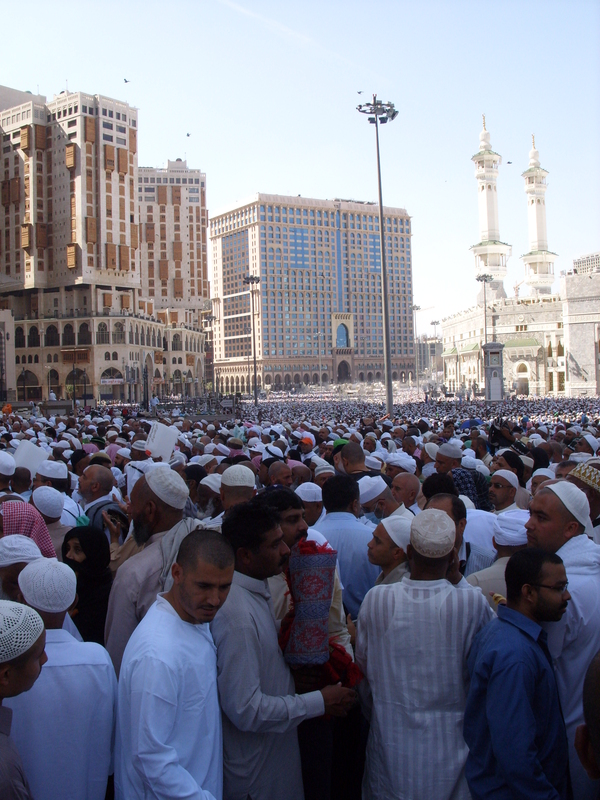 Hajj is so much of a vacuum, a controlled environment, chaotic as it was. Here, the test and the ease come hand in hand. In real life, it takes time to pass from one to another. Decades pass before resolutions can be conceived. Those are real tests, they require real patience, subhanAllah. Ya Rabb, please continue to guide me and show me how best to proceed from here. After ‘Isha, I left the Haram and walked towards ‘Aziziah. I walked for about 40 mins, also saw the birthplace of the Prophet, which the Saudi’s have turned into a library. I also saw the mountain pass the Muslims were exiled to during the boycott years. Everything’s right there, North of the Marwa side of the Masjid Al-Haram. I missed the line of cabs outside of the Haram. I kept passing up guys offering rides because they were charging way too much. Before I knew it, I had walked well beyond the limits of the masjid and ended up in some dark back alleyways. It’s my own fault really, for always ending up in these situations. I thought I was heading in the right direction, I tried using the enormous clock tower as my guide. My navigation skills were terrible. I only ended up further and further into some slummy looking neighborhoods. The interesting thing is that they were all Hajji housing and hotels still, they were just really shady looking. Everyone there was Indian, with their flags posted up everywhere. I had no incidents in Little Hajji India, Alhamdulillah, but I was trying so hard to not look lost or out of place. Eventually, going down the dark alleys, trying to find my way up to the main road, I hit a series of dead ends and decided to just backtrack to the masjid again, to regain my bearings. I made my way back to the masjid and caught a cab, Alhamdulillah, after I passed through a tunnel that seemed about 2 miles long. It was the first time in my trip thus far that I was actually, genuinely afraid I might die. People were driving so reckless in the tunnel – making U-turns, reversing, speeding, driving the wrong way…all in a one-way tunnel- and I realized…I was all alone…with barely any identification on me. If I died, I thought, would my parents ever even find out? That thought freaked me out and kind of made me paranoid. So, when I was finally able to find a cab driver, I was so thankful. The driver that picked me up was actually a young kid, probably no more than 15 years old, definitely not a real taxi driver. He was probably pushin his dad’s whip around to make some extra cash on a school night, but I didn’t care, I needed the ride. Alhamdulillah, he gave me a fair rate and brought me back to my place. He even picked up an Iranian couple along the way and had me translate to them how much money they owed. I speak neither Arabic nor Farsi, so I don’t know how that worked out. Straight gesticular. I later realized I was actually attempting to make a 5.5mi trip from the Haram to ‘Aziziah by foot, with no real idea of which direction to go in. I’m settled in now, took a shower, freshened up, Alhamdulillah. I’m actually really hungry now though. I think I’m gonna step out and grab a bite down the street. There’s an awesome place across from us, they sell this amazing chicken Sajji from Balochistan. There’s also a really good Punjabi restaurant around the corner that makes fresh lentils and naan that we’ve been crushin on the regular. So convenient :). Then, I’ll head back in and pass out. Tomorrow is Jummah. We’re planning to go to the Haram and pray there and do our Tawaf Al-Wida’, before coming back to ‘Aziziah. Saturday afternoon, we leave for Jeddah to catch our flight back home iA. The trip is winding down and finding its way to the end. Everything is calming down and collecting itself so smoothly and beautifully, Alhamdulillah. Allah is the Best of Planners. This entry is being written from inside the Cave of Hira. SubhanAllah, it’s a zoo, even up here. This is no place of retreat. I found a little nook in some shade right above the cave’s passageway, still inside, but above everyone. There’s such a nice, cool breeze blowing. It’s like 20 degrees cooler in here, even at 12:30pm, it’s comfortable. It’s got to be at least 90 degrees outside otherwise. My feet touched the mountain at 10:50am. It took an hour to reach the top, so many people, still so much trash. We have left nothing sacred. Everyone going up was either Desi, Afghan, Turkish, or Russian – lots of those mountain folk. There’s also no rocks left inside the cave. I thought I’d be slick and grab a few to give to people, pieces of the cave of Hira. I found a few in the entranceway, those will suffice, people jacked the rest. I could totally chill up here for hours, especially since I’m out of the way. I can see how the Prophet would meditate here. If there were no one around, this place would be truly serene. The view is sick too, you can see all around in every direction. 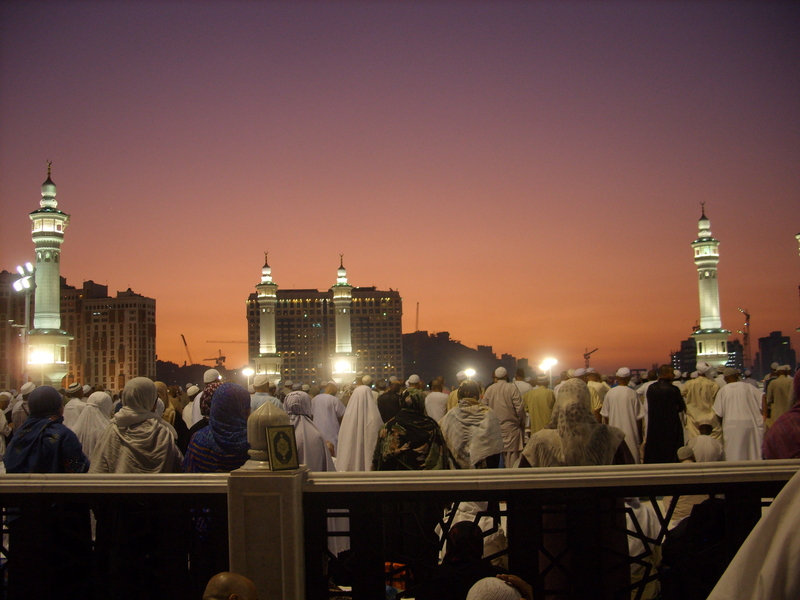 You can’t really see the Ka’aba, but you can see the Haram, especially the minaret and towers. If there was less clutter, and smog, you could probably see better. Who knows which part of the cave he would actually sit in, where he would face, where his blessed hands had touched. For once though, I’ve finally come to a place preserved from the Prophet’s life. These are original walls, these rocks have bore witness to the beginning of revelation and to the opening of something superbly magnificent. This place has become a full-blown tourist spot though. You think, ok, I’m going to climb a mountain, this is going to be somewhat spiritual and enlightening. Instead, along the way, there are jammed routes of people, tea and juice stands, beggars, and chinese tasbih and kufi salesmen. Everyone and their mom is on their cell phone, climbing up. Seriously? You know I even had a dude standing next to me at the Ka’aba, with his hand on the wall, during tawaf, calling someone! He was Desi and spoke in Urdu, so I understood. He was like, “Ah, yeah, ok, I’m here at the Ka’aba, any du’a you want me to make? ?” I’m like dude…smh. Ok, I’ve been here for about half an hour, it’s still every bit as crazy. I’m going to pray Dhuhr on top of the mountain iA, that’ll be dope. Maybe, I’ll drop by the Haram afterwards iA. The cave has graffiti all over. The mountain itself is completely defaced. Graffiti everywhere, people tagging their names, garbage all over the sides of the slopes. The cave itself is just a passageway that goes through a covered area in a series of stacked boulders, to the Southern face of the mountain top. 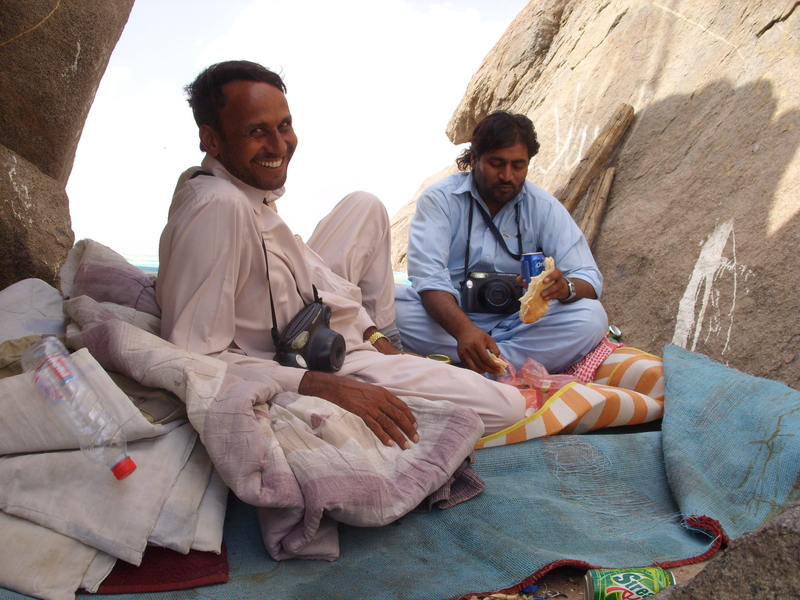 I think I’m actually technically on top of the cave of Hira, but it’s still covered by a canopy. I’m gonna just peek my head into the cave in a few minutes, then head back iA. There’s no pollution up here at least, finally some clean air – just sand and dust. The cave itself is littered with empty water bottles and crushed juice boxes, subhanAllah. I still can’t get over that. People push, shove and fight each other to get up the mountain and into the cave but they don’t even give these places basic respect and dignity. Allah save us. Guide our hearts. Help me to benefit from my journey to this place and to these Holy Lands. Ameen. Close to 2pm. I’m still on top of the mountain, away from the crowd finally, sitting out front, near the edge of the mountaintop. There is sakina finally. I didn’t actually step foot in the proper cave area – not really concerned actually. It’s all about the retreat and I’ve found that. Takes some time for it to settle in, but it’s here. 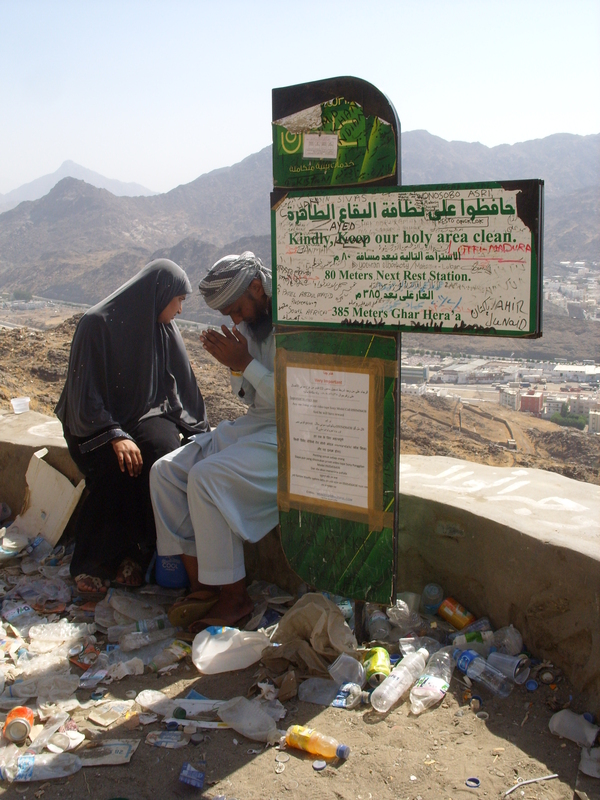 I just prayed Dhuhr on top of Jabal An-Nur, right on top of Hira, subhanAllah. Everything around looks so small and more calm, finally. You can still hear some car horns, smh. Other than that, Mecca and its surrounding towns are put into perspective. The mountains are so much more prominent in the landscape now. The entire area is covered with mountain ranges – great big enormous fixtures. No wonder Allah makes reference to mountains so much in the Qur’an – they’re very much a part of everyday life here, for the ancients at least. There’s so much peace in climbing to the top of the mountain, facing the Qibla, and making salah. There’s a hadith about the excellence of this act at a time when the world will be so chaotic, such a retreat would better benefit man. Totally get it. Time to go iA, 2:05pm. 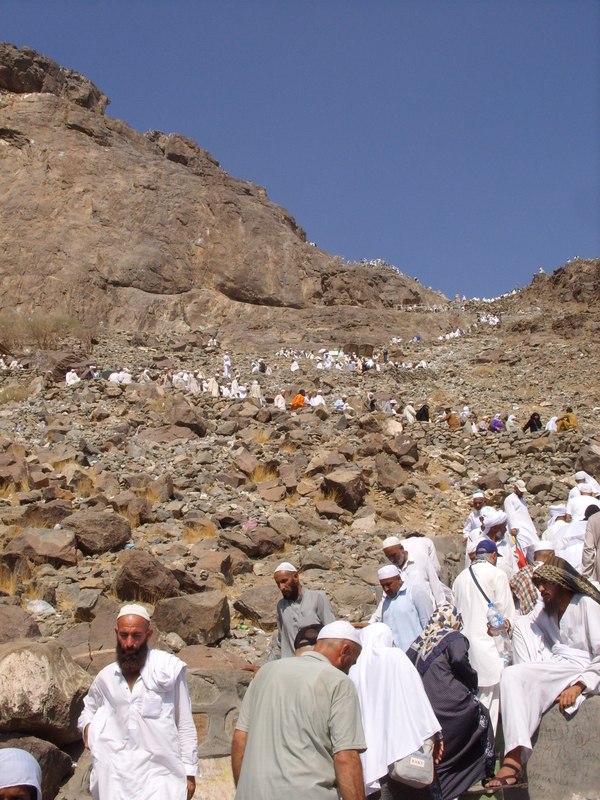 The cave of Hira is located at the top of Jab Al-Nur, The Enlightened Mountain. It is located a few miles outside of downtown Mecca. Before receiving revelation, it was the habit of the Prophet, peace be upon him, to retreat to this cave for long periods of time. He would prepare food and supplies for many days and go to the cave to meditate and ponder on the nature of this life and our existence in this world. This was the beginning of Prophethood, the beginning of revelation, the beginning of a great movement that would change the world forever. It all began in that quiet, humble little cave, at the top of this great mountain, overlooking the Sacred House.